for the Okotoks Film Festival! The Okotoks Film Festival (OFF) brings inspiring and fun new films to the Okotoks and surrounding communities. Showcasing international films with programming for all ages, the festival also includes workshops and galas. Okotoks Alberta is located just south of the city of Calgary, and the festival runs from June 8th to 10th. 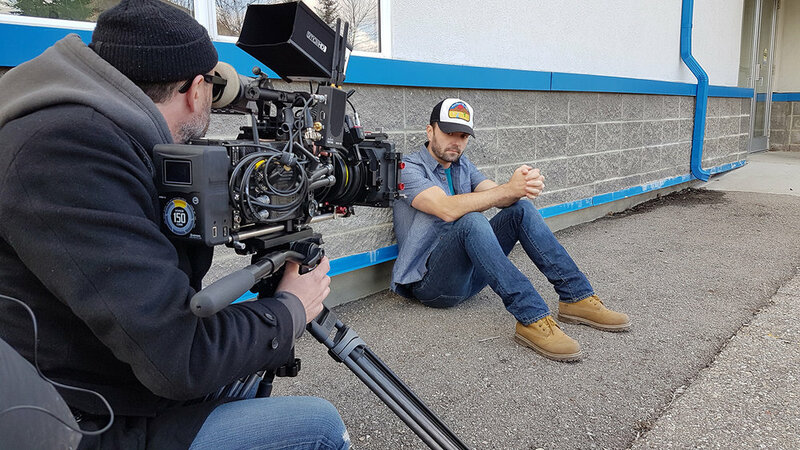 ICE BLUE (starring Michelle Morgan, Sophia Lauchlin Hirt, Billy MacLellan and Charlie Kerr)was shot in and around Okotoks and Director Sandi Somers and Producer Scott Lepp are excited to present ICE BLUE in the town that it was shot in. The business owners in Okotoks were so supportive and giving. I loved shooting there and felt a great sense of community. Director Sandi Somers and Producer Scott Lepp will also be participating in an interactive workshop at the festival about the creation of ICE BLUE as one of OFF’s workshops. Definitely a great opportunity for emerging and student filmmakers to learn more about developing, creating, and promoting a feature film in Canada. The film will be screening on Friday June 9th at 7pm. Director Sandi Somers and Producer Scott Lepp will be in attendance for a Q&A following the screening. Tickets and passes for the Okotoks Film Festival are on sale now!